The name is Bond… James Bond! GoldenEye was the first Bond film to feature Pierce Brosnan as the super suave and famous officer, James Bond. We’re still not over his performance! akweelife / Eon Productions Ltd.
With the bow tie that this cat is wearing and his tuxedo fur, he looks just like the handsome British agent. 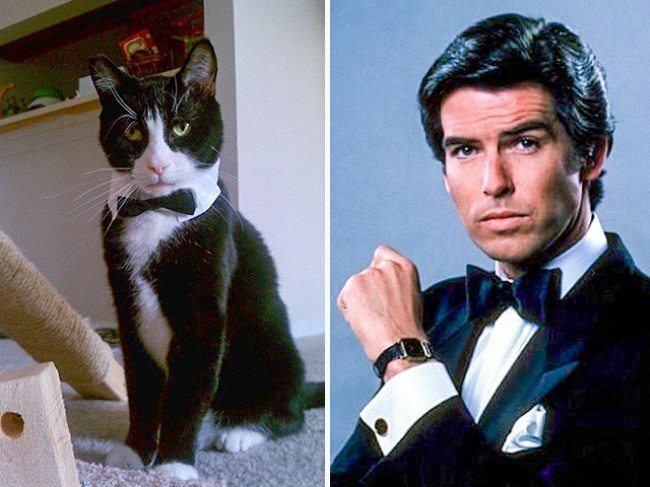 Oh, and this cat likes his cat food shaken, not stirred. 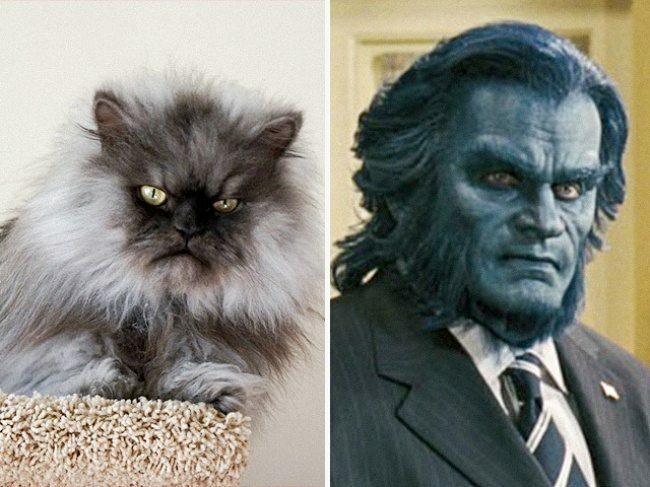 Hank McCoy, a.k.a. 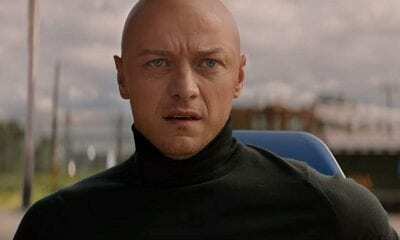 The Beast, is actually one of the most delightful and lovable mutants of the X-Men. Not to mention that he’s an incredibly smart genius! It’s hard to think about Kylo Ren without thinking of Emo Kylo Ren or Adam Driver’s gorgeous locks. He may not be the most fearsome villain ever, but he tries. This cat has got the whole look down. The fur/horns, the cheekbones, and the scary look are all perfect. Now, to make sure he stays away from spinning wheels… But wait, there’s more! If Mr. Schrute isn’t at Dunder Mifflin being second in command to Michael Scott or being antagonized by Jim Halpert, then he’s probably at Schrute Farms harvesting some beets. 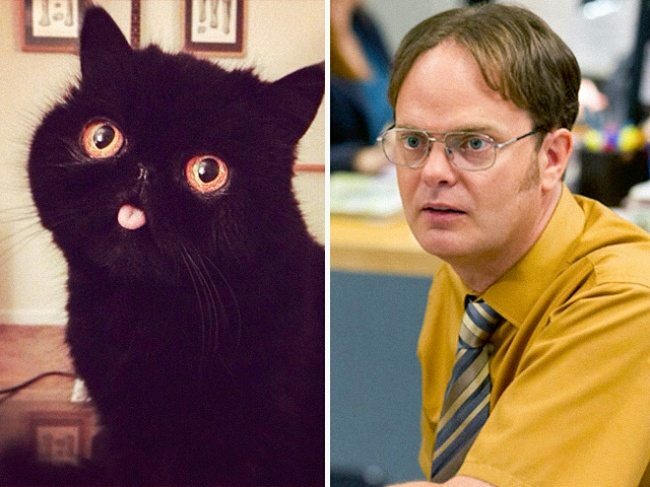 This cat gets Dwight’s look down perfectly. The clueless expression and helpless demeanor… yep, it’s there. Of course, that’ll all change once Dwight unleashes his black-belt skills on you. This villainous character wants his mother’s fortune, and he won’t hesitate to kill you or anybody else standing in his way! 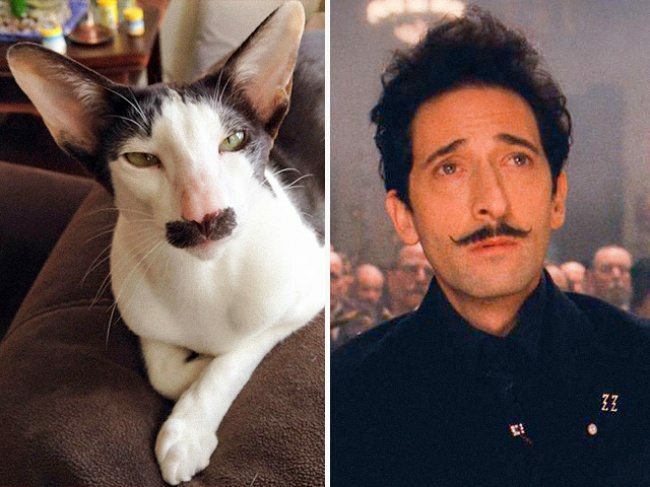 This cat channels Adrien Brody’s character with his sinister mustache and long, thin face. With a performance like that, he’ll be winning his own Oscars in no time! This cat is so smooth, we totally see the resemblance between him and Cullen. They’re even wearing the same coat! 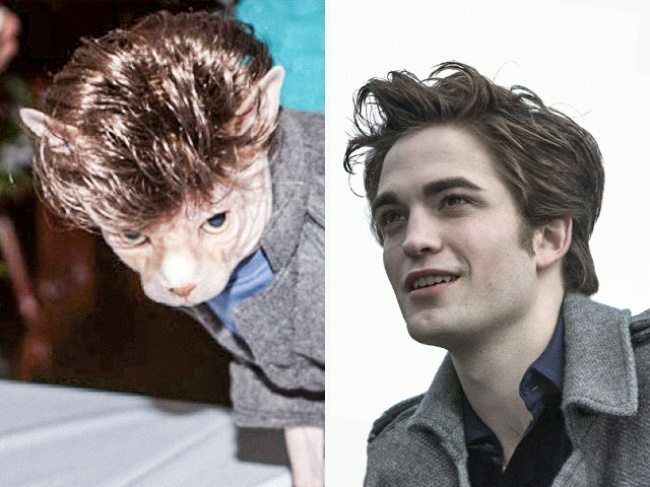 Edward better keep Bella away from this kitty! 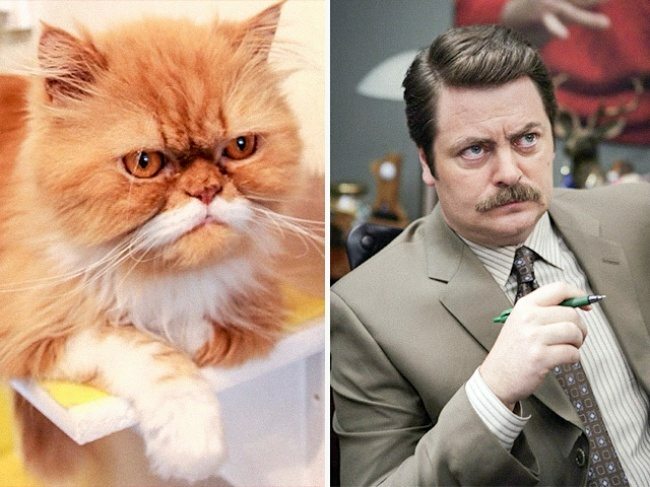 There’s also nobody more masculine than Ron Swanson, and also not many people with a bigger cult following! Nick Offerman, you did good, buddy. Everyone knows who Charlie Chaplin is… He’s the king of comedy, an English actor, filmmaker, and composer who rose to great heights during the silent era of film. Ha ha! 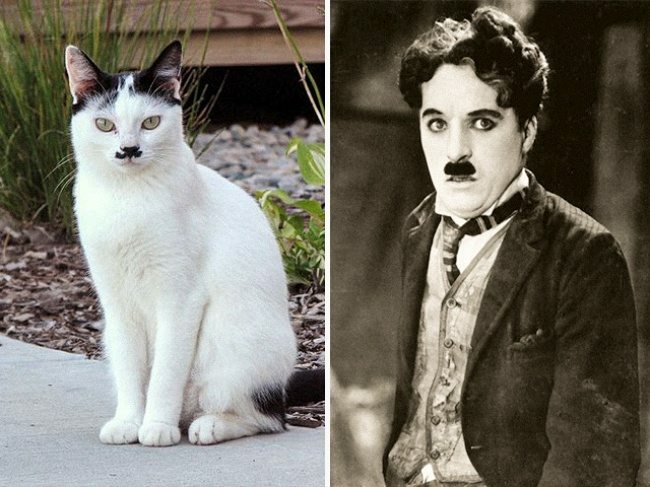 Of course, Charlie Chaplin is easily recognizable for his super thick mustache, which this cat replicated perfectly! We wonder if the cat is as good at physical comedy as Chaplin was…? If you’ve seen the first season of Game of Thrones, then you definitely know who Khal Drogo is. Khal means chieftain, which is exactly what Drogo is! A highly influential character, he’s known for more than just his muscles. 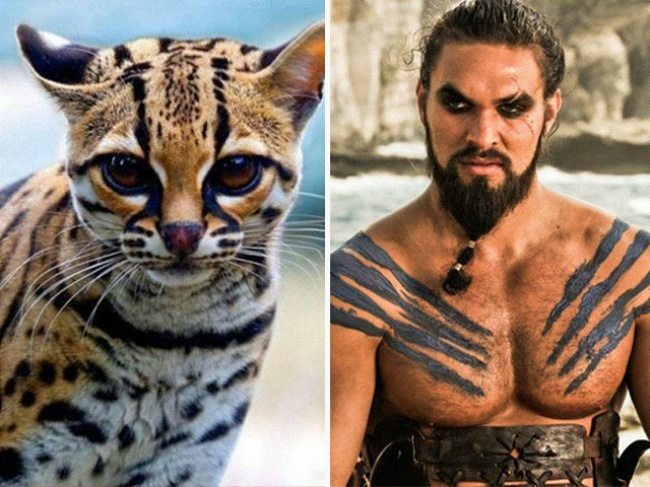 This cat has got that ferocious warrior look completely spot on, down to the dark eyes and the tattoos across Drogo’s chest. 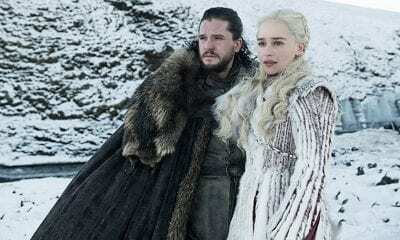 But wait, there’s more Game of Thrones coming up! 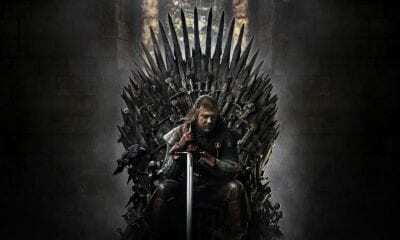 Sandor Clegane, or “The Hound,” is fierce, not very chivalrous, and altogether not the most likable character. 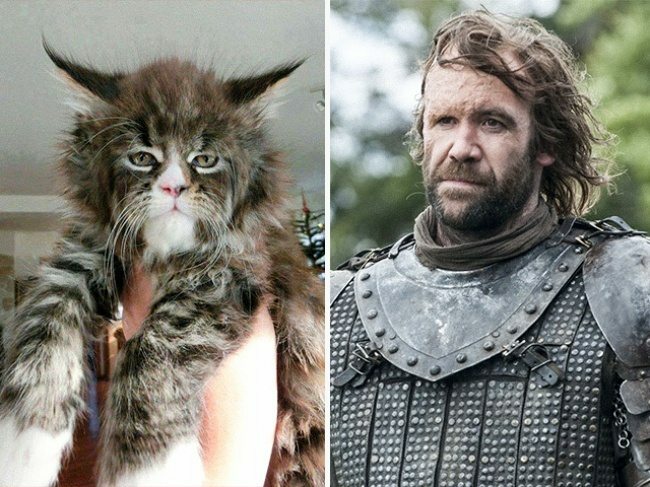 From the House Lannister, Clegane was best known for being one of King Joffrey’s most terrifying bodyguards. 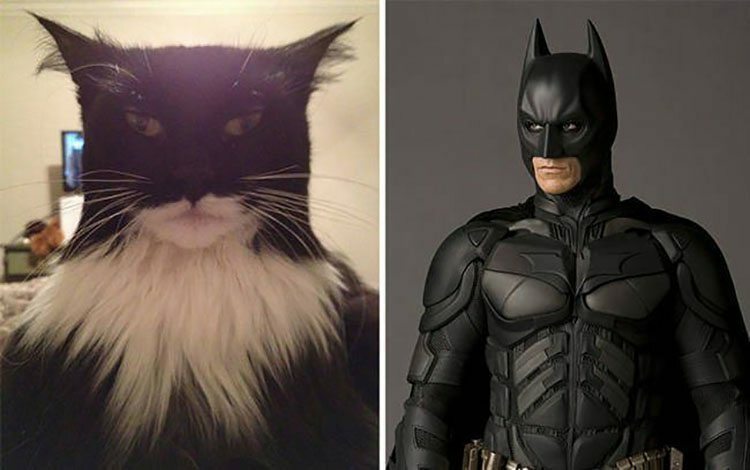 We all know Batman, but what about Catman? A superhero who’s dedicated his life to fighting crime, one ball of yarn at a time. You can clearly see this cat is serious about his crime fighting business, though we’re not sure he’d be as big on helping humans in the process. Maybe if they paid him in catnip? 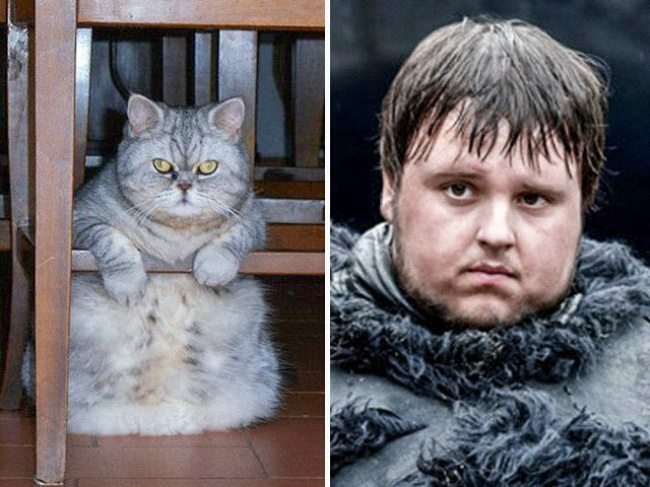 Samwell Tarly has had an unfortunate life (hasn’t everyone on Game of Thrones? ), as he was forced to join the Night Watch, nobody’s favorite thing. 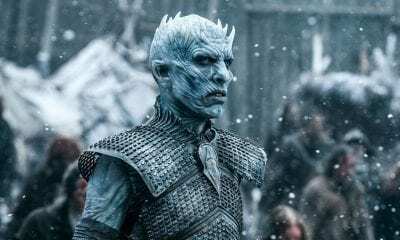 However, he’s also Jon Snow’s best friend, so that counts for something, right? This cat looks a lot like Sam, having a similar face and the right color scheme to match Sam’s coat! Their expressions are also very similar! 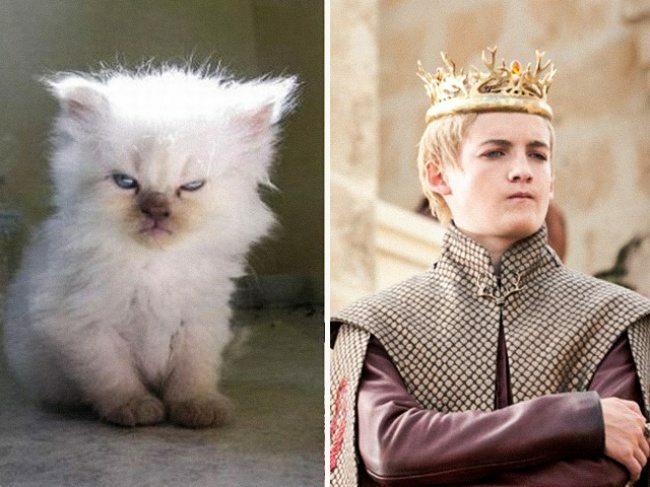 Ahh, King Joffrey, how we love to hate you. Though somewhat cowardly, the King has got a very prominent cruel streak that won’t make him hesitate to cut anyone down. You can clearly see that cruel expression on this cat’s face! It looks like he’s just sitting there, waiting for the right moment to strike… Beware! Melisandre is often more simply as the “Red Woman,” a woman who is also a Red Priestess of R’hllor, the Lord of Light. She’s nobody to take lightly! 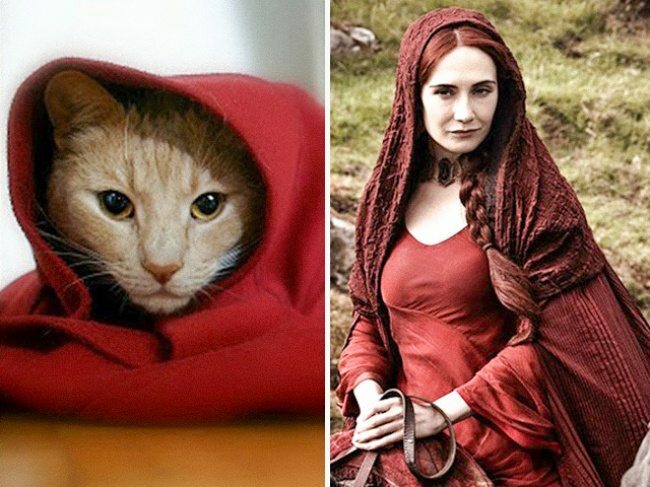 Not only is this cat wearing a striking red cloak (we should call her the Red Cat), the cat also has that calm, cool look down that only the Red Woman can master. Mr. Burns, also known as Charles Montgomery Plantagenet Schicklgruber Burns, or Smithers’ BFF, is Homer Simpson’s infamous boss, and owner of the Springfield Nuclear Power Plant. He’s also a pretty mean guy. 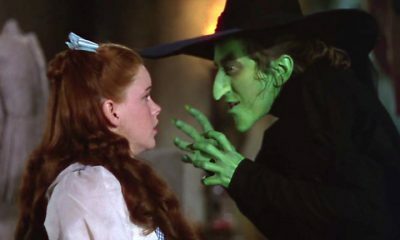 He is famous for his greed and evilness, which is definitely something this can can relate to. He has the same Excellent, devilish smirk! We wouldn’t let him near our power plant. 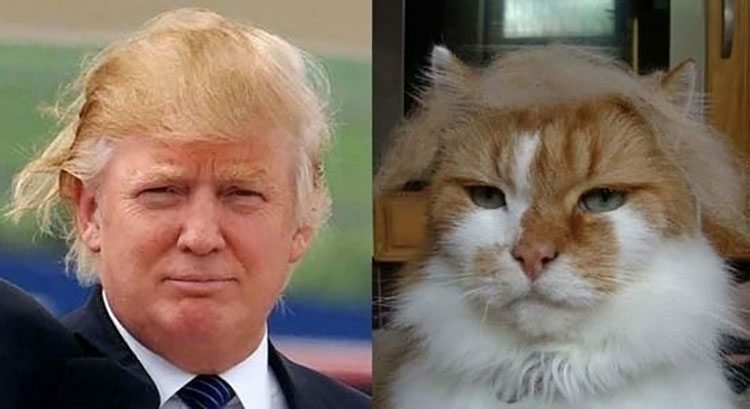 Now, all this cat needs is a little help with his comb over, and he’ll definitely be ready to run for president. Look at that face! That’s a face for making America great again. This kitty may not have Trump’s knack for finance, but he definitely has that ice cold, “You’re fired” look. House cat, house elf, what’s the big difference? Well, physically, there isn’t much! 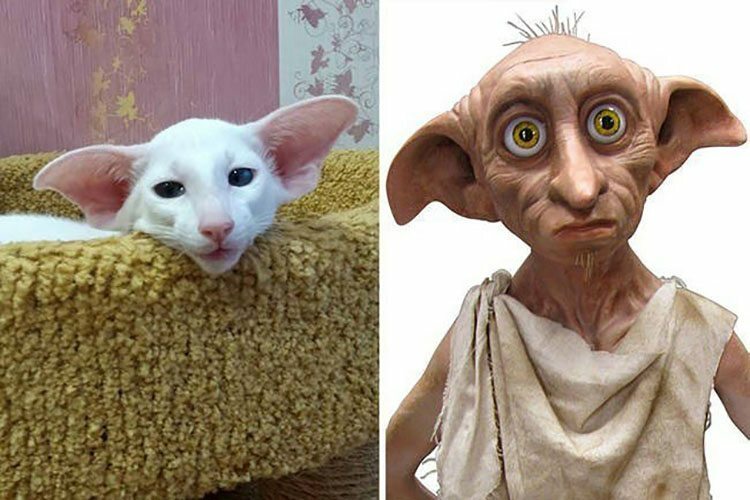 This adorable big-eared feline looks so much like Dobby from Harry Potter, we wouldn’t be surprised if the character was based on him. He probably shares the same affection to smelly old socks, too. 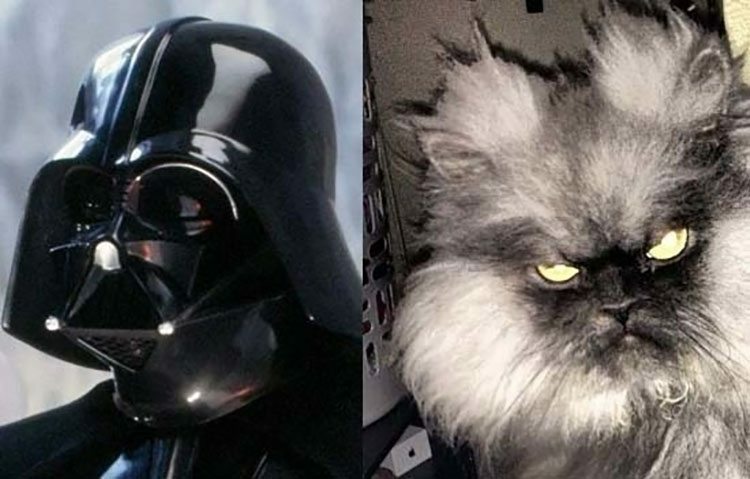 Behold, this cat has joined the dark side. 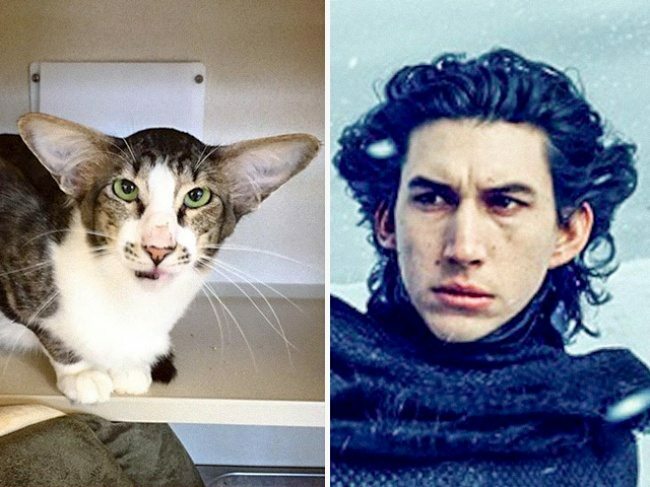 This cat and the former Jedi knight have a lot in common- you wouldn’t want to mess with them both. The former President of the Sons of Anarchy, Clay Morrow is no longer around, but that doesn’t mean we still don’t sorta love/hate him. A hero-turned-villain, there’s no denying the badass-ness of his character. 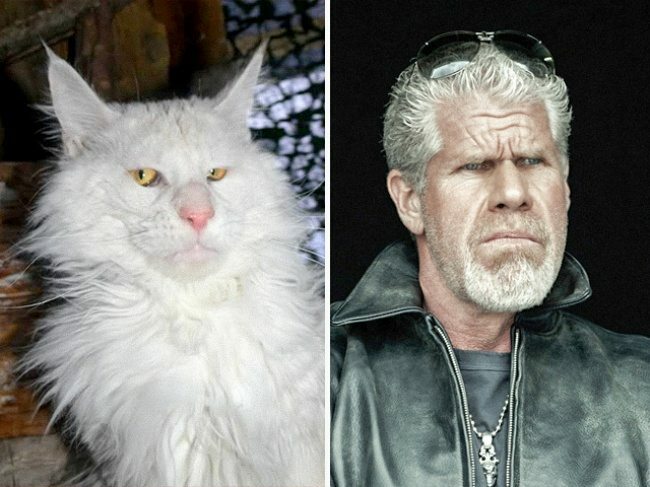 Give this cat a motorcycle, and he’d fit right in with the rest of the bunch. As Morrow says, “It ain’t easy being king.” We’re sure this cat would agree! 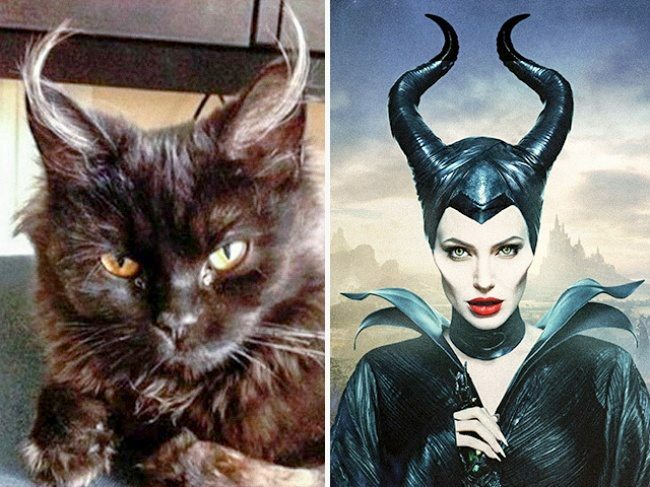 SHARE this post with your friends if you find the similarities hilarious!